Naturally Authentic | Exploring the scary concept of "Authenticity," naturally of course. So lately I have been approached from strangers, family, and friends saying, “I have decided to go natural, what do I do now”? I have found myself repeating my tips over and over again. Finally after having this conversation 1,000 times I have decided to blog about it. As you all know this is based off of “my” experience of transitioning back to my natural hair. The methods that worked for me may not necessarily work for you. View returning to your natural hair as a journey of trial and error and self-discovery. There will be great feats of success and substantial moments of failure but they all will be educational. 1) Decide exactly how you will return to natural. Are you going to transition or do the big chop? If you decide to big chop are you going to cut your hair, let a friend cut your hair, or go to a professional? Research these options and decide which one is best for you. If you choose to do it yourself or call a friend over to cut your hair, make sure you have researched how and where to cut. Take into consideration how much hair you are comfortable with rocking. I recommend wetting your hair and look for the place where the straight hair ends and the textured hair begins. This place is called the line of demarcation. This will give you a general idea of how much hair will be left on your head. If you are comfortable with that, then you or your friend can commence to cutting. If you aren’t willing to take any chances and would rather a professional cut your hair then begin calling around to salons asking them do they know how to cut textured hair. Most will tell you yes but ask them will they cut your hair wet or dry. If they say dry, run! No seriously, say thank you, hang up, and continue your search for a qualified stylists. Doing your big chop dry will only result in them cutting more hair than necessary or not enough. Also, unless you want it cut into a style, tell them you are only interested in getting rid of your straight ends. I chose to go to a professional and that’s exactly what I requested along with making it even all around. Keep in mind if you request it to be even they will cut off more hair. Let’s say you wet your hair and you are not comfortable with the amount of hair that will be left. Then you can simply transition with various heatless styles until your hair grows long enough for you to be comfortable. When I decided to return to natural, I transitioned for 5 months and then big chopped. It took me that long to be ok with parting with my length and it was difficult for me because my hair was healthy and chemical free but it was heat trained or damaged however you choose to look at it. Personally, I don’t think of it as damaged since my intentions were to straighten it and keep it straight. Anywho, after 5 five months I grew tired of dealing with 2 textures and decided it was time. Your next option is long term transitioning. This is where you trim your straight ends a little at a time while wearing various heatless styles until you trim the last of your straight hair. This option gives you the opportunity to learn your natural hair over time. You will also have time to master all the of the natural styles and seeing what options work and do not work for you. This path is the for the extremely patient and determined to keep their length natural. Please note that no matter what path you take they both involve scissors in your hair! 2) Research, Research, and more Research. Now that you’ve decided how you will return to natural it is time for you to learn about natural hair in general. Read books, google, and join forums that teach about the properties of your natural hair. Find out what your hair type is and I say this loosely because you really shouldn’t get caught up on hair typing but you will hear about it so I will address it here. More importantly learn about the density, porosity and texture of your hair. These are all important when it comes to what methods you will implement as well as what products you choose. Speaking of products, you will try lots of them and that’s ok. It is not ok to go broke, but start off with a little at a time and as you figure out what works and what does not work, adjust accordingly. Also, make a mental note of the ingredients that are in the products that work. They will be an indicator of other possible products you may want to try in the future. Accept the fact that trial and error is apart of the entire journey. Some products will cause your hair to scream yay and other products with cause your hair to scream what is this!! Don’t give up. This is what every new natural experiences. Use tools like youtube and the knowledge you’ve gained to narrow down products and styles that work for you. This is also the time to develop a regimen. 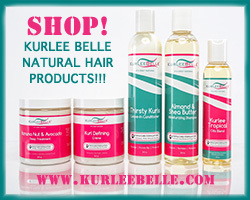 A hair regimen is ideal for keeping focused on nurturing your tresses so that you can reach your natural hair goals. It will help you keep up with what is going on with your hair at all times. This is crucial for when you have a hair faux pas. You can back track and figure out exactly what you did differently or what you used that you do not normally use. It also works for your triumphs as well. 3) Own it Honey! Love and appreciate YOUR hair. It is a must that you learn to love and appreciate the hair that grows out of your head. I always encourage new naturals to watch as many youtube videos as possible to glean information and tips that could enhance their natural hair journey. However when you start to compare your hair to another person’s hair problems occur. The purpose of your journey is to get to know and love your natural hair. Be inspired by what you see and learn how to make it work for you and your hair. Also accept your hair’s limitations and realize that where you are limited in one area is only an opportunity for you to be creative in another area. Remember… Comparison in any form is an act of violence against the self- Iyanla Vanzant. What advice do you have for new naturals and those who want to go natural? I want to hear from you.